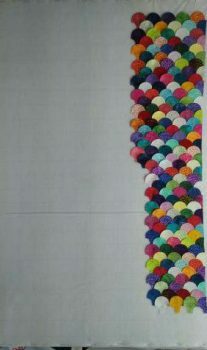 For my first clamshell project, the fabrics were arranged in alternating rows of light and dark. The shapes were prepared using the Apliquick method and hand sewn row by row, a process described in a previous blog post. 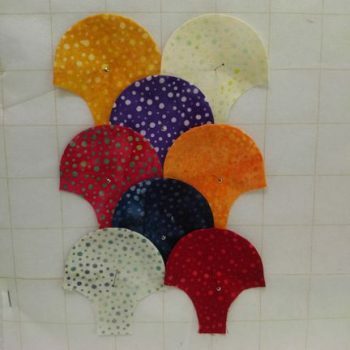 For my next clamshell patchwork project, I went completely scrappy with Hoffman “Dot Pops” – 40 different fabrics laser-cut into 2-1/2″ strips in bright polka-dotted colors. I wanted to be able to lay out all the clamshells and balance the colors before sewing, so the row by row method wasn’t ideal. 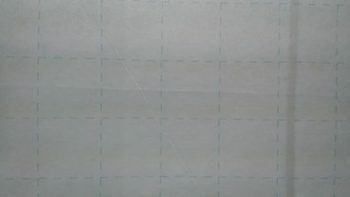 I devised a method using Pellon gridded interfacing and here’s how it works. Two-inch wide clamshell templates are available precut from fusible paper made with a 50%-soluble natural fiber. 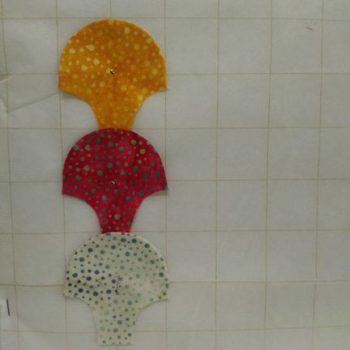 The papers do not need to be removed since they will semi-dissolve on washing and remain safely inside your project as soft fibers. Iron a clamshell template onto the wrong side of the fabric. 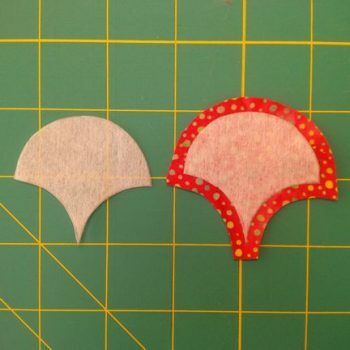 Cut out the clamshell shape from the fabric leaving an approximate 1/4-inch seam allowance. … then turn the seam allowance over the edge of the interfacing using the Apliquick rods. 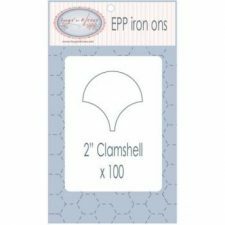 This method makes it very quick and easy to prepare your clamshell shapes. 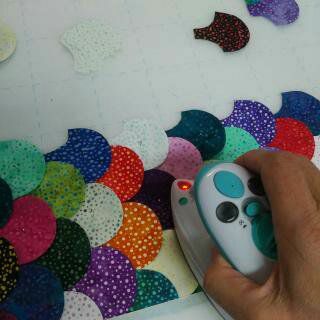 Cut a piece of gridded Pellon fusible interfacing the size of your project. 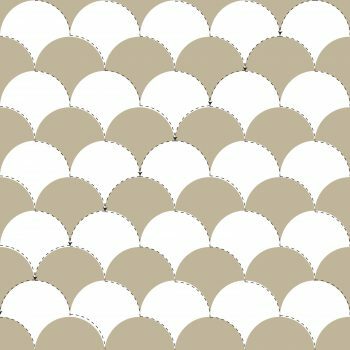 For 2-inch clamshells, 1-inch gridded Pellon interfacing is ideal but a 2-inch grid will work too. I stapled the Pellon, along with a layer of batting, fusible side up to a large piece of cardboard so that I would be able to pin the clamshells before fusing them in place. Position a vertical row of clamshells using the printed grid as a guide and pin in place. Position the second and third vertical rows so that the raw unturned edges of the clamshell bases are covered and keeping the clamshells aligned with the printed grid. Pin in place. 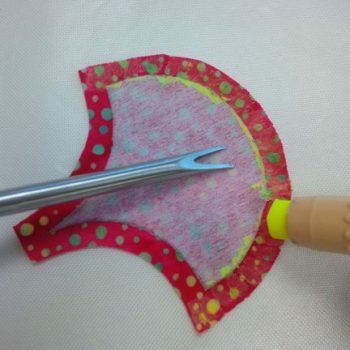 With some or all of the clamshells in position, iron the clamshells to the fusible interfacing and remove the pins. Take care not to touch the iron directly to any of the exposed fusible interfacing or it will melt onto your iron! 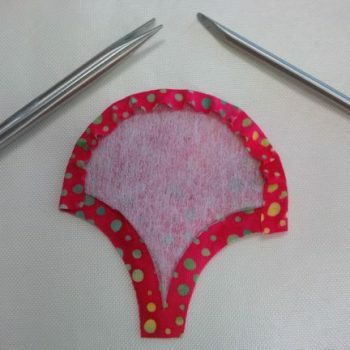 Once all the clamshells are arranged and fused in place, remove the staples and take the clamshells and interfacing off the batting and cardboard. 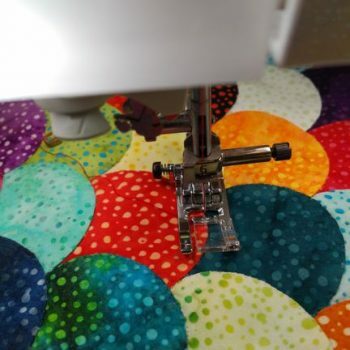 Stitch the clamshells together by machine using a small zigzag stitch or a blind hem stitch. To minimize the amount of pivoting while sewing, here’s a tip. 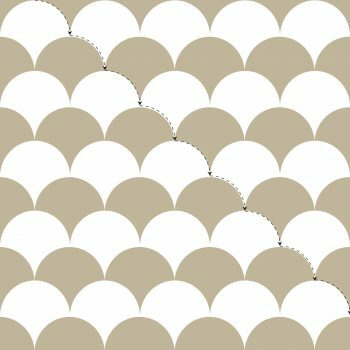 Work diagonally, sewing only half a clamshell at a time – or a quarter circle. 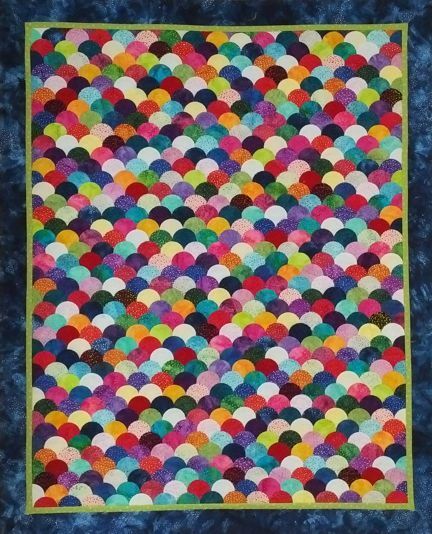 Once all the halves have been sewn diagonally in one direction, turn the quilt and stitch the other halves of the clamshells. 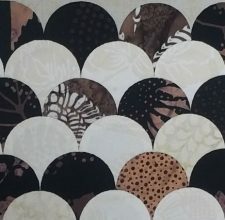 It won’t take long before you have a completed machine stitched clamshell quilt!